Let’s hope the Obama administration this week delayed its deadline for picking the next generation of Air Force tankers for good reason, as claimed ─ not as a cave-in to those who want U.S. taxpayers to fund European jobs. To kowtow to Europe’s EADS and their mostly Republican U.S. allies for the wrong reasons would only hurt the U.S. economy and encourage scandalous conduct that’s been occurring on both sides of the nearly decade-long EADS rivalry with Boeing over tanker contracts. Talks this week between President Obama and French President Nicolas Sarkozy resulted in a Pentagon announcement March 31 that it would delay its deadline for bids 60 days until July 9 if desired by EADS, the acronym for European Aeronautic Defence and Space Co.
Obama said during a joint press conference March 30 in Washington that he promised Sarkozy that Defense Department decision-making would be “free and fair” because the U.S. wants to hold a transparent bidding process. The contract’s value officially is estimated at $35 billion, one of the largest in American history. But the value could be vastly higher because the contract winner gets vital momentum for similar deals with other nations around the world. Political, financial and military leaders of five world powers are active at their highest levels. In addition to France’s leader, Russia’s Vladimir Putin, Germany’s Angela Merkel and the United Kingdom’s Gordon Brown are also interested in securing jobs from the U.S. contracts. Boeing issued a statement April 1 denying any legitimate reason to extend the bidding past DOD’s previous deadline May 10 to accommodate the Europeans. EADS has been pushing for a longer bidding process that might push final decision-making past mid-term U.S. elections. In jockeying for an EADS victory that would create a large assembly factory in Alabama, the state’s senior Republican Sen. Richard Shelby in February put a blanket hold on 70 top-level Obama federal appointments. Shelby disrupted the Obama administration as it entered a critical phase of its second year after numerous delays in appointments during the first year that are keeping holdovers in many key slots throughout government. In Alabama’s middle district, for example, Leura Canary remains as U.S. attorney despite being one of the nation’s most controversial “loyal Bushies” (the term comes from a former Bush DOJ chief of staff) targeting such key Democrats as Alabama’s former Gov. Don Siegelman. Later, Shelby backed off in blocking all Obama appointments after flexing his Senate muscle. As a countermeasure, the Obama administration just made 15 recess appointments to try to secure control of federal bureaucracy before too much more time passes. But the political clock is ticking in other ways if EADS and its backers can nudge final Pentagon decision-making on July bids a few more weeks into the period after November’s U.S. elections. Republicans are expected to gain far more congressional clout. At that point, the Republican mastery of Senate rules even when they’re in the minority, combined with European financial muscle could threaten Boeing, which is no slouch itself in power politics in the United States and internationally. Ensuring an award to EADS was a factor, according to my sources, behind two of the past decade’s most notable federal corruption prosecutions, those of Siegelman and former Air Force Assistant Secretary Darleen Druyun. An independent review is the primary focus of my work with the start-up Justice Integrity Project. Prosecutors dispute any political motive in either investigation. In 2006, federal authorities working through Canary’s office convicted Siegelman, regarded by my political sources as less adept than his Republican rival Bob Riley in the congressional and international clout needed to ensure an EADS victory and an Alabama reassembly plant. Riley had been a leader in House military appropriations before narrowly defeating Siegelman in 2002 gubernatorial election. As a congressman and then as governor, Riley cultivated contacts with Russian raw material suppliers and France-based manufacturers who are major advocates of EADS. Also, the federal authorities won a corruption conviction against Druyun, building on initial investigative work by Boeing’s opponents in the competitive intelligence community. Earlier, Druyun had helped Boeing obtain highly favorable terms on Air Force tanker leases. She then received a $250,000 per year job at Boeing in 2003 after her retirement from the Air Force. Her conviction helped overturn the initial Air Force award and reopen bidding, which is still continuing with this week’s extension. This kind of intense interest in building airplanes is, of course, well-understood among Washington’s lobbyists and those whom they fund for elective office. Closely following such contract awards also are national security proponents and business leaders in localities hosting proposed factories. Mobile County, for example, maintains an advocacy website called Save Our Tanker, where I’ve signed up as a “supporter” to receive news updates. Another major advocate for EADS is the Business Council of Alabama, whose CEO/president is the prosecutor Canary’s husband William Canary. He’s also the former campaign manager for Riley in his 2002 victory against Siegelman and a former Republican National Committee chief of staff. Boeing and its supporters foster similar efforts, including plans to apportion the tanker jobs around the U.S. to gather strong bipartisan support among congressional delegations. Boeing’s claims that more U.S. manufacturing jobs will come from an award to a U.S. based company. But traditional “Buy American” procedures have been eroded over the long term as both parties seek the financial rewards of globalization, as well as compliance with fair trade rules. Boeing’s advocates include Republican Senators Sam Brownback of Kansas, which has an estimated 3,000 Boeing employees, and Lindsey Graham of South Carolina. They were among the senators who wrote Obama March 31 to urge the president “to move forward on the Air Force tanker competition without delay.” Their letter noted a March 23 final decision by a World Trade Organization panel that European governments had illegally subsidized the EADS subsidiary Airbus. The current fleet of tankers used for mid-air refueling was built by Boeing in contracts dating back five decades. In 2001, Boeing was awarded a renewal of the contract. Riley, as a member of the House, undertook discussions with French and other European interests to secure their support for an assembly plant in Mobile. Riley also won Alabama’s 2002 election with the help 6,000 votes stricken from Siegelman’s election machine totals after polls closed on election night in Baldwin County, which adjoins Mobile on the Florida border. Throughout the early part of this decade, Siegelman was targeted for investigation on corruption charges via what became a massive federal-state probe that Republican administrations headquartered at Maxwell-Gunter Air Force base. Siegelman’s lead prosecutor was a powerful colonel in the Air Force reserves who supervised the case, including prospective witnesses brought to the base for pre-trial questioning. In 2005, Siegelman was indicted and a year later convicted in his second trial on corruption charges as he planned to run for re-election. His main convictions were for seeking donations from a businessman for a non-profit advocating for better school funding and then reappointing the donor to a board. 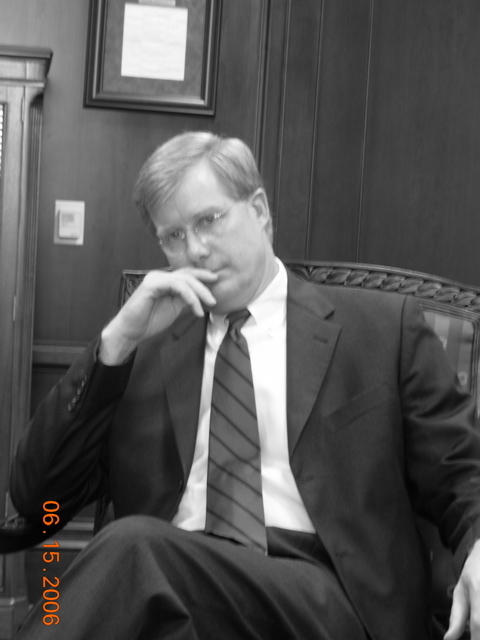 Siegelman’s judge, Middle District Chief U.S. Judge Mark Fuller, meanwhile was being enriched by the Air Force as the principal stockholder of closely held Doss Aviation. Siegelman’s judge held between 32 and 44% of Doss shares while the company was receiving hundreds of millions of dollars in Air Force contracts to refuel Air Force planes and train Air Force pilots. All individuals mentioned above and both the Bush and Obama Justice Department have denied any special political or Air Force motivations in the Siegelman prosecution, despite claims of misconduct by whistleblowers and a witness interrogated at the Air Force base. Also, Fuller has declined to recuse himself for conflict of interest, saying not one reasonable person in the U.S. would think it necessary. Former White House strategist Karl Rove’s best-selling new memoir Courage and Consequence defends Fuller stock-holdings during Siegelman’s prosecution, and denies any Rove involvement in Siegelman’s prosecution. The Justice Department has agreed with the judge, and is seeking 20 additional years in prison for Siegelman. The Obama administration seeks to prevent any Supreme Court review. Meanwhile, the Air Force’s contract award via Druyun’s office was overturned in 2005 after Sen. John McCain of Arizona led the Senate Armed Services Committee investigation exposing Boeing’s corruption with Druyun. EADS (via its North American subsidiary) and its then-partner Northrop Grumman then won the tanker contract. The award vindicated the high hopes of those advocating what had once been a long-shot bid. Benefits extended beyond Mobile to the economies of the nearby Florida Panhandle and Mississippi, and of course to European interests performing much of the work. In 2008, the Associated Press documented that McCain’s Presidential campaign was being supported by a number of EADS backers, including McCain’s co-chairman and key financial supporter Tom Loeffler, a former Texas congressman whose firm lobbied for EADS. Federal contractors and foreign citizens are forbidden to contribute, but not their allies. Last June, the Government Accounting Office overturned the EADS/Northrop Grumman award, saying that the Bush administration’s criteria had been slanted to favor their planes. Northrop Grumman dropped out of the bidding this year, saying the bidding process was too expensive and its bid with EADS was unlikely to succeed under Air Force specifications. That left Boeing’s opponents scrambling for credible partners and strategies. Last month, a Los Angeles lawyer said his client United Aircraft, a holding company for several Russian aircraft companies, would soon announce a joint venture with an unnamed U.S. defense contractor to seek the contracts. But the company itself denied interest, and Russia’s prime minister edged away from advocacy of that proposal. EADS has kept up its momentum via the direct talks between the French and U.S. presidents this week on a variety of world issues. Among other topics, the leaders agreed on what they described as a fair process for the tanker bidding. Behind those benign words looms the titanic struggle for jobs and power among nations. The stakes were portrayed in a March 19, 2008 column by Washington-based commentator Wayne Madsen, a former National Security Agency analyst, Fox News contributor and active volunteer leader for McCain during his 2000 presidential campaign in Northern Virginia. Madsen, now a TV commentator for the Russia Today cable program, wrote two years ago about McCain’s 2008 efforts: “Tomorrow, McCain will be feted at a campaign luncheon at London’s swank Spencer House at St. James Place by Lord Jacob Rothschild and Nathan Rothschild.” Madsen went on to describe at length ties between U.S., EADS, Russian, Alabama and other leaders supported by such influential players as the Rothschild family and the Carlyle Group. For the moment, however, most are downplaying tensions publicly. Pentagon spokesman Geoff Morrell said this week that the deadline change is the only modification that the Defense Department will make to specifications for the 179 refueling tankers. Even the 60-day delay is 30 days short of what EADS has requested to make a viable bid. The Pentagon then needs months to review the bids, aiming for a decision just before the November elections.